Beacon Hill Boston Map| Find Beacon Hill Apartments | Beacon Hill Restaurants | Beacon Hill Hotels l Beacon Hill Shopping. The historical Beacon Hill neighborhood, of Boston, Massachusetts, offers some of the finest dining, shopping and hotels in the country. Some of the most beautiful, and oldest, residential brownstown buildings in Boston are located in this historically protected area. Due to it’s vintage look and feel, it’s steep, narrow, cobblestone streets make for some fabulous photos. Thus, this picturesque neighborhood is often featured in magazines. Additionally, the most famous parks in Boston are only blocks away too: Boston Common and Boston Public Garden. Five star Beacon Hill restaurants include: The Paramount, 75 Chestnut, Ristorante Toscano, Figs, Ma Maison and The Tip Tap Room. World famous “Cheers” bar and restaurant, based on the popular TV show, is also a priceless photo opp. Charles Street runs through the middle of the neighborhood, featuring one of a kind stores full of local artisans’ wares. Out of town visitors can also treat themselves to some of the top hotels in Massachusetts. The most popular Beacon Hill Boston hotels include: Hotel Commonwealth, Taj Boston, Eliot Hotel, The Hyatt Regency Boston, Westin Copley Place and the Sheraton Boston. Tourists have many options to learn about Boston: Duck Tours, walking tours, and bus tours abound. Whether you’re shopping or dining in Boston, or on a business trip or vacation at one of Massachusett’s best hotels, you are sure to find something to please every member of the family. Additionally, don’t forget to visit the nearby neighborhood of Back Bay Boston and Fenway! Public Garden-Beacon Hill-Boston, MA. 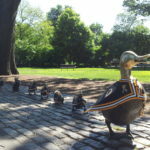 The Make Way For Ducklings statues dressed up in Boston Bruins hockey uniforms!